This is a story from May 2006 which I had sent out to my friends as an email with subject as either "Once in a life-time adventure" or "Good story to tell my Grand Kids". Visit Vancouver. Get work visa extended. Last day plan scenic round-trip drive in Canadian Rockies. 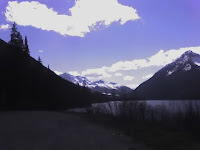 Rent car and drive up the Sea-to-sky highway to Whistler and beyond enjoying picture-postcardesque scenery along the way. 70 miles from nearest town on a two lane curvy and lonely road. Speed on one curve create gradient, and along with gravel on road, and lightness of car, make car develop own mind. Car decide to curve around, come to a halt on the opposite side of the road, turn over and stick wheels to the sky. Self dangling upside down, held by seat-belt, enjoying a different perspective of surrounding scenery of grass, stones, etc through broken wind-shield. Unbuckle and crawl out through broken window pane. Review damage : Car in unmovable state, Not a single scratch on me, no cellphone coverage, rental agreement with insurance coverage limit financial damage to $300. YESSSS!!!! SOME ONE UP THERE LLLLLLLLLIKES ME !!!!! Enter stage left: Friendly Boat Salesman in a SUV. Ride with FBS on the way back learning the ins and outs of Aluminium Boat industry and about his own recent car-does-belly-up-turtle-act accident which had resulted in some severe damage to the body of the human and the car. Reach nearest town and report incident to Cute Woman Police Officer. Get report of incident from CWPO and report to rental agency. FBS and CWPO find common interests and exchange phone numbers. Continue on journey with FBS learning about the adventures possible in Vancouver Island and about the way to identify Albertans driving in British Columbia and other interesting things. FBS thrilled to get CWPO's phone number. Bye Bye FBS in Horse Shoe Bay with "Go easy on those rental cars, ey!" Continue scenic tour on bus and reach Airport. Take flight home. The rental car company asked me to pay $350 ; I should say it cost me very little for such an awesome adventure! I should contact Mr. FBS soon, and tell him that I have taken his advice and not turned over any other rentals cars so far. One minor regret: I didn't think of taking the photo of the belly-up Car. Or even better a photo of the belly-up car with the Driver who sent it belly-up would have been perfect! The only souvenir from that accident I have with me is a piece of glass from the wind-shield, which somehow got into my bag, for me to discover after returning to US. I am preserving it carefully to show it in the future as a proof of having been through a miraculous experience!